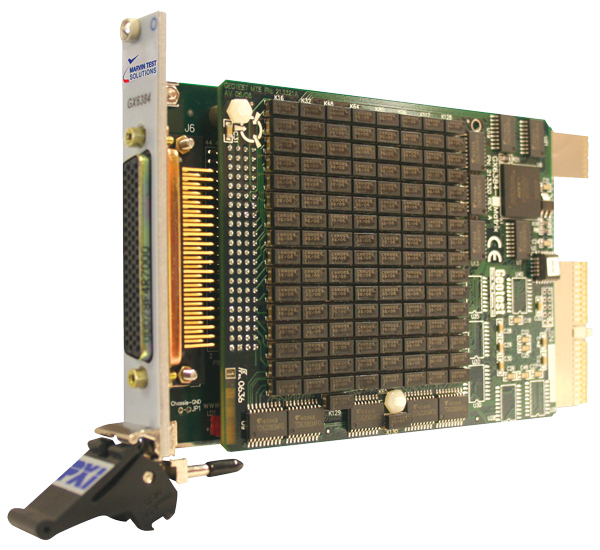 PXI Switching, Configurable High-Density Card - GX6384 | Marvin Test Solutions, Inc. The GX6384 3U PXI multiplexer switch card provides users with the ability to switch and interface tester resources to multiple UUT connections. The card is available in three different configurations, supporting 32 x 2, 32 x 4, and 32 x6 switch configurations. Each version of the GX6384 can be software configured as a single or dual relay matrix. The –1 version can be configured as a dual 32 x 2 or single 64 x 2 matrix. The –2 version can be configured as a dual 32 x 4 or single 64 x 4 matrix. The -3 version can be configured as a dual 32 x 6 or single 64 x 6. The GX6384 is supplied with the GXSW software package that includes a virtual instrument panel, a Windows 32/64-bit DLL driver library and documentation. The virtual panel can be used to interactively program and control the instrument from a window that displays the instrument’s settings and status. In addition, interface files are provided to support programming tools and languages such as ATEasy, LabView, LabView/Real-Time, C/C++, Microsoft Visual Basic®, Delphi, and Pascal. Help file and PDF User's Guide provides documentation that includes instructions for installing, using and programming the board. Connector 78-pin D Sub-type connector. Includes mating connector.